This unique stone is cut to highlight natural concentric bands and a rich natural terra color. 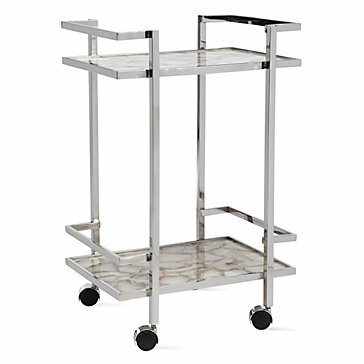 Known for its density and resistance to acids, The Agate Bar Cart is an ideal addition to your entertaining repertoire. Please note that this is a natural mineral and each piece is unique to itself and can vary in size and color.